Circular in design, these cuff links offer a little something different in terms of design while still being simplistic. The entire body is made out of stainless steel and is lovingly polished until it gleams, while the front is black IP plated. If you're looking for something a little more subtle to wear yourself or to give as a gift, then these could be the ones you're looking for. Being circular in shape, they won't stand out too much on a shirt because they more closely match a button rather than a piece of jewelry as many other cuff links do, but they still add a little something for the close observer. 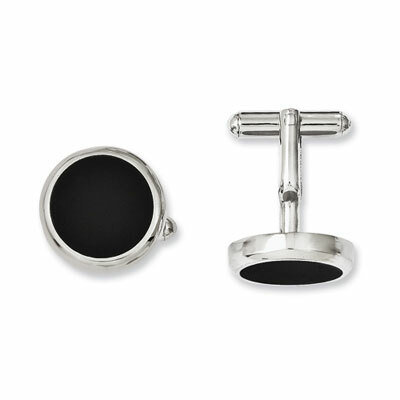 Our round stainless steel cufflinks have a black IP-plated center that can from casual to formal without a problem. We guarantee our Stainless Steel Black Round Circle Cuff Links to be high quality, authentic jewelry, as described above.